I'm delighted to be able to tell you about a brand new raw food book, written by Emma Couttie MacDougall: 'Me Raw:You Cooked'.This book is a must if you're in a relationship with someone who doesn't share your views about raw food! Fittingly for this week, it is not just another raw food book, but a true love story. 'Me Raw: You Cooked is the first book of its kind, written for raw foodists and their non-raw partners providing valuable insight in to a raw-cooked relationship. 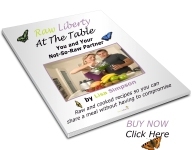 Co-written by my partner and myself, Me Raw: You Cooked details what happened in our relationship when I made the decision to 'go raw'. It outlines a very personal story of the ups and downs of a raw-cooked relationship as well as giving useful advice on how to overcome the practicalities of maintaining raw and peace at the dinner table! Me Raw: You Cooked is different than a lot of other raw food books because it was written from both perspectives with both partners in mind. If you are raw you will find guidance on the kinds of issues that may arise between you and your partner. If your partner is raw you will glean insight in to what to expect. A further bonus of Me Raw: You Cooked is the recipe section which contains some delicious tried and tested dishes aimed at raw-cooked couples with fantastic recipes that can be easily adapted and shared. and add 'rawliberty' in the special instructions. I have just discovered this fabulous new Raw UK based online network, UK Raw Food Network :) created by James Alexander. A great place to hang out with like minded people, and gain the raw support that so many of us need as we embark on our raw journey, when those around us think we've 'lost the plot' by turning our backs on society's 'normal' way of eating. This is the place to make new friends who are into RAW. Also its a place for you to share your experiences & yummy recipes, upload pics, videos, articles - or what ever you like to share about RAW. The UKRFN is a bit like Facebook, in that you can upload Pics, Videos, join & create Groups, With a few extras like modify your Profile, Shop & listen to the Radio and much more; Yet the great thing is that unlike Facebook, its unique to RAW... This means that you are among the like minded, Experts and Novices together, creating a great community of Teachers & Students pertaining to RAW food & The RAW food Diets! We shall be having monthly articles on RAW - chefs, teachers, restaurants, events, bloggers and anything else we can find about RAW, especially in the UK! Feel Free, and Happy using this network. The UKRFN is for your Benefit & I sincerely hope that you find it a useful and exciting new experience! • Keep an eye on discussions at our FORUM Feel free to add your own experiences! • Please help us by Adding a LINK from your forum, website, facebook or any media you use! • Remember tune in to the the all new RAWDIO, which is here from Jan 2010, with great interviews, tips & advice & about RAW. If you wish to nominate someone for an blog article or radio interview, please let me know! • There are a lot more things you can see and do, from viewing & uploading videos, pictures, and much much more! • IF there is anything Else that you would LIKE to see on here, please let me know! Just have fun and learn to be Healthy and Energised!